There are some moments in life where the old and the new meet, and retro is always in vogue – it is just a matter of which particular era that should take centrestage at that point in time. 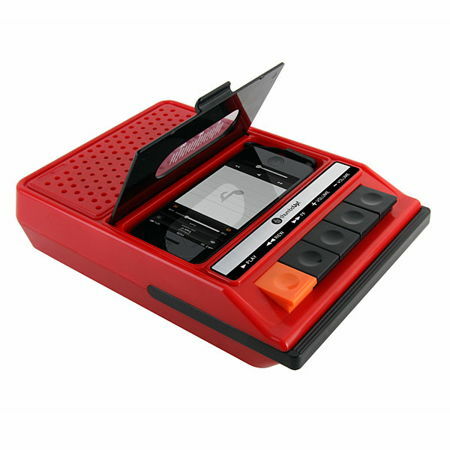 Well, the $39.99 iRecorder would be an interesting play of bridging both the old and the new, as it looks like one of those Retro Cassette Players, except that in reality, it carries a very different function – by being a portable speaker for the iPhone. The iRecorder would play nice with the iPhone 4, iPhone 4s, iPhone 5 and iPhone 5s, anything older than the iPhone 4 would not work. Oh yeah, and one more thing – no longer do you need to keep a pencil around the house handy, as the iRecorder will not eat your tape. Those who grew up in the era where cassette tapes were the most popular choice for listening to music would be able to identify with me. The iRecorder would run on a trio of AA batteries, and connects to your iPhone via the standard issue 3.5mm plug. One thing that bugs me though, the gaudy color in which it comes in does not really appeal to my taste, how about you?